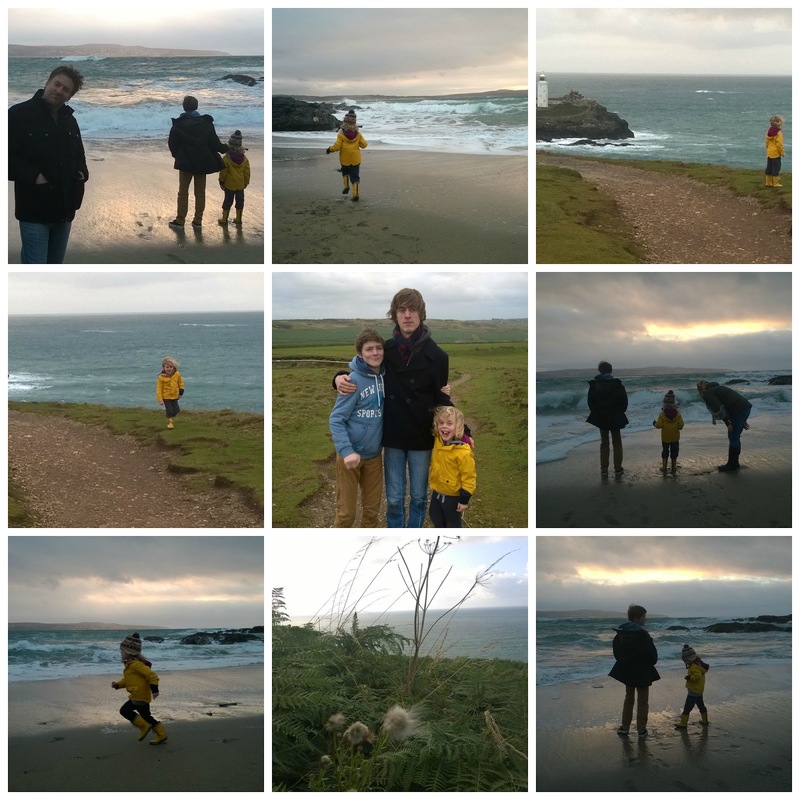 On Christmas Eve we went to Godrevy and lay flowers for Granny. Me and my boys walked up to the the top of the headland that overlooks the lighthouse, and lay a small posy on the Bronze Age barrow that marks our private spot of remembrance. The boys ran and played. Even Sam, who forgot his cool seventeen years for a little while and enjoyed embracing the child that still lurks in his tall and gangly frame. There was laughter and gentle banter. A relief from the often incessant bickering that I have been used to from my three. We spotted seals swimming offshore and lumbering out of the sea onto the beach far below. It was the first time we had seen such numbers all year, and it was rather lovely to watch them going about their business. The heather that sweeps over the headland was tucked away into the soil. And the carpet of wild flowers that adorn it were no more than sparse pared back dried forms of former glory. I stood and soaked up the raw beauty all the same. It was late afternoon, and the weather had conspired to create the most beautiful backdrop. Grey cloud, broken at intervals by the low winter sun bounced and played over the bay. We made our way down to the beach to play. The wind had stirred the sea into a display of froth tipped waves, sending foam and sea spray into our faces. We ran in and out of the surf, and clambered over rocks. All the while gulls wheeled overhead, and two more seals popped up out of the water to watch us. It was a rare and magical few hours, and a precursor to our festive holiday. I gave quiet thanks as we drove home for chippy tea, a glass of red and the last minute wrapping. We have had a quiet Christmas, which has suited me very well. We have not ventured far, and I have not been subject to the usual stress that I feel at this time of year. I have eaten. far. too. much. of. everything. I have read and watched rubbish telly. I have built Lego, drawn pictures, taken long hearty walks, had many early nights and really tried not to vacuum every day. Thank you for all of your words of love and support. I was afraid that if I returned here too soon, I would write terribly maudlin pieces of self indulgence. It's something I definitely didn't want to inflict on anyone, especially myself. Equally I didn't want the gallows humour that has helped this family cope with the difficulties of seeing a loved one so ill, seem trite and lacking in compassion. I guess I shall go with the flow. It's worked so far here. 1. To stop saying "That's fine" when it really isn't. 2. A biblical de-clutter. I am drowning in plastic and frou frou. And before all of that, I'm throwing away the last of the After Eights. Unless you want them? I could just do with an After Eight. Nice to see you back Leanne. So glad to see you back - I've missed your posts. There's something about New Year that makes me want to declutter too. I've just read an article about a woman called Marie Kondo who is a declutter expert. Her advice seems helpful. Hope 2015 is good for you and your family. What a thrill to see a post here today, Leanne. I'm curious to know how you usually respond to your children's bickering. Mine bicker at times and I really can't bear it. I find that I yell at them to stop, then regret doing so later on. Any tips? It was so nice to see your post this morning, Leanne. I have wondered and worried about you over the past few weeks. I'm glad you had such a nice family time together on Christmas Eve. Those are the kind of memories that will stay with you all your life. As time goes by all the episodes of bickering will slowly fade away. I would take you up on your offer of the After Eights if it wasn't for the fact I've eaten pounds of sugar myself over the holidays. Hello there lovely lady. I too was so pleased to see your post. As always your photos show a family where love shines through. Bickering is better than indifference xxxx lots of gentle thoughts for 2015! Lovely to meet you..from a week one Five on Fridayer. Leanne, I stumbled across the name of your blog and I thought to myself . . . I have got to visit. Then on coming here and reading your posts and viewing your photography . . . well, all that I can say is, "I am hooked". If I had the talent to write like you, I would be delighted. You have a special way of adding music to your sentences. Do you write professionally? Your photography is wonderful, too. Been thinking of you and yours Leanne - Go into 2015 in the same spirit and you and your family will continue to flourish. I love the idea of having a special time for remembering those no longer with us during the festive season, there is a season.... Connie is right! You write in musical, lyrical sentences, lovely to hear. Declutter, vacuum, do whatever you want to do. So glad walking in the great outdoors is your priority, blowing the cobwebs away - that and playing with Lego! I approve! Glad to see your new post, Leanne,and more of your photography. Sounds like the Christmas you all needed and your resolutions match mine! With much love and best wishes for 2015 for you all. What a treat to go to the shore and see seals! We live just outside Chicago and I don't even want to think about what would wash up along the shore of Lake Michigan, although sometimes it can be beautiful. I've already begun our de-cluttering and the Mister isn't happy about the fact that he has to find a home for much of his "junk". Happy New Year to you! I'll take the After a Eights, thanks. With the amount ive eaten, a few thousand more calories will just get lost in the noise. Yesterday we had the final food clear out. Eat it or bin it. Mince pies, cake, chocolates, cheese. Now it's just the four pounds of excess weight baggage to go then..
Good to see you back Leanne. Keep taking the beach walks, it's what I did back in October. They help so much. Happy New Year, Leanne, from here in South Devon. What wonderful photos you have posted and, like you, I had a great walk on Christmas Eve with extended family ... in other words, the family of our younger son's partner (her brothers, their wives, their children and his partner's parents), plus ourselves, our elder son and his fiancée and their little boy (our grandson), plus younger son's dog ... 17 of us in total, plus a dog. Others out for a walk must've thought we were some sort of ramblers' club! But it was great fun. I was suffering from chocolate withdrawal symptoms today so bought a bar of Bourneville (not the best quality choc, but just what I fancied) ... husband and I allow ourselves 4 little squares after our supper and then when the bar is finished, that's it. No more until we do a bit shop again. Good to see you Leanne. And a rather shaming sense of 'Yay, someone else had overindulged like crazy too'. We've been pre-Lego-ing (Duplo) all Christmas. I'm very into it and have built some Grand Designs-worthy structures. Go me and my mastery of pre-school toys. Seriously though, I hope 2015 is a good one but understand how hard it is for you at the moment. The notion of things being 'good' sometimes seems impossible. Wishing you all the best and sending love your way. Hello, so pleased you're back. Gallows humour is the norm in the face of adversity here. I started saying 'No' a lot more last year, it's liberating. 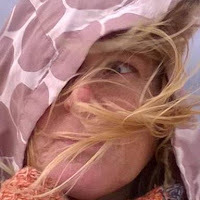 Just discovered your blog via Laura's Year in Books project 2015. I have been reading through whilst on my break. I will certainly return again. Sorry you've had a rough time hope the new year will be a little kinder. How lovely of you to visit. And thanks for the kind words.